Harry [Herschel] Levit, American. 1912-1986. Studied at The Pennsylvania Academy of the Fine Arts. Exhibited at - The Art Institute of Chicago, Brooklyn Museum, Metropolitan Museum, New York, Pennsylvania Academy,and The Whitney Museum of American Art. 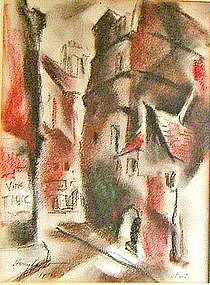 Crayon or pastel on paper signed Harry Levit 1933. Paris. 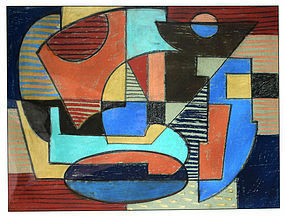 Image - 8 3/4" x 12".